Upeasy UPE-3 Seat Assist helps you stay active and independent. With up to 70% lift assistance for those up to 350 lbs., Seat Assists are self-powered and lightweight. They travel wherever help is needed to get in and out of your chair. The economical choice to help maintain an active and independent lifestyle. Washable, 100% polyester cover with easy clean polyurethane cushion. Why people choose the UpEasy UPE-3, UPE 3 Seat Assist by Uplift Technologies. This economy unit has polyurethane foam and a washable cover. 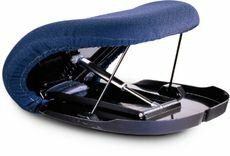 Safe, patented LeveLift Technology curves the seat to a flat surface lifting you on a level plane with no forward dumping. Durable polycarbonate base has non-slip material to prevent shifting on fabric seating surfaces. Easy care with washable covers and cushions that can be cleaned with mild soap and water. Adjustable lift for those from 94lb/43kg to 350lb/159kg. No batteries, no electricity, no problem! Seat Assist is self-powered by a hydro-pneumatic gas spring. Just fold your Seat Assist flat for easy transport and with the built-in handle, take it everywhere. Simple to use, when you’re ready to get up, just lean forward to stand and your Seat Assist automatically provides assistance.